Prototype: Fictitious class Henschel DHG 700 diesel locomotive, two gondolas, and a low side car, painted and lettered for the German Railroad, Inc. (DB AG), DB Cargo Area. Model: The locomotive has an mfx digital decoder and a special motor. 1 axle powered. Traction tires. The locomotive has triple headlights that change over with the direction of travel and a warning light on the cab roof. These lights will work in conventional operation and can be controlled digitally. Warm white and yellow LEDs are used for the lighting. The locomotive has coupler hooks. The gondolas have removable load inserts for "coal" and "sand". All of the cars have Relex couplers. Train length: 45.7 cm / 18". Contents: 12 no. 24130 curved track, 4 no. 24188 straight track, and 4 no. 24172 straight track. A track connector box, a 230 volt / 36 VA switched mode power pack, and a Mobile Station are included. An illustrated instruction book with many tips and ideas is also included. This starter set can be expanded with the C Track extension sets and with the entire C Track program. The ideal way for the entire family to get started in the digital world of model railroading. Modern train composition for Era VI. The built-in mfx decoder automatically registers itself in the Mobile Station. Maintenance-free LEDs for the locomotive lighting. 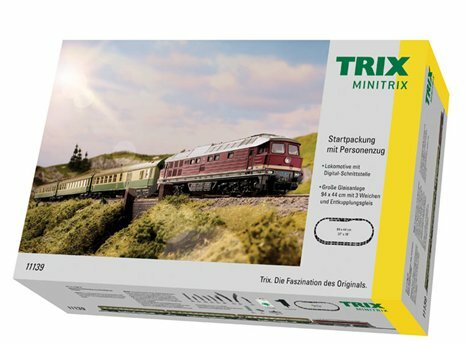 The 29853 starter set is being produced in a one-time series for the Märklin Dealer Initiative (MHI). 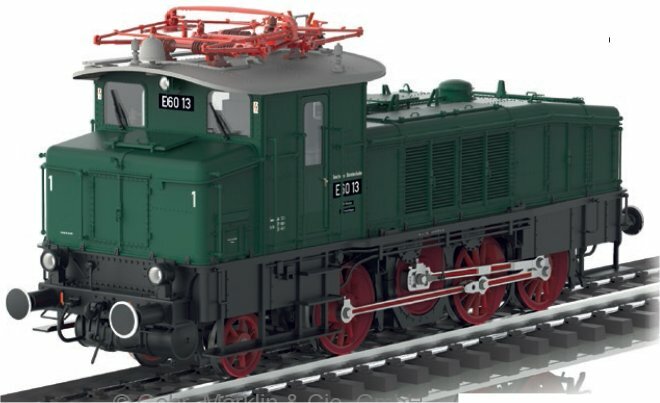 The DB AG would have been well advised to make use of such a beautiful diesel switch engine like the Henschel type DHG 700 C, but at least in the world of model railroading this is becoming reality. At least a similar looking unit, the type DE 500 C, with only diesel-electric drive and less power was allowed to prove itself as road number 259 004 from September 8 to December 19, 1983 on the DB as a loan locomotive. The Henschel Works in Kassel produced diesel locomotives with cardan drive for medium heavy and heavy switching work on industrial and branch line railroads as far back as the early Sixties. While the fourth generation Henschel locomotives still had rounded body shapes, this changed with the fifth generation starting in 1973 to squared-off superstructures. The model shown here belongs to this generation. The designation DHG 700 C stands for a diesel hydraulic locomotive with cardan drive, about 700 HP performance and three sets of driving wheels. On this unit, a diesel motor transmits its output to a hydrodynamic Voith transmission with flange-mounted multi-step gears and reversing gear and this output is again transmitted by means of cardan shafts to the wheel sets. In addition, the multi-step gearing enables changes in speed and allows a maximum speed in the switching range of 30 km/h / 19 mph and in the regular range a maximum speed of 50 km/h / 31 mph. All of the propulsion components are built into a rigid frame with the small wheel spacing guaranteeing reliable operation on curves with a radius of only 80 meters / 262-1/2 feet. Henschel produced 55 units of this model between 1973 and 1985. These locomotives were placed into service mainly with mining companies (Saar Mining Company: seven units) and steel producers as well as chemical firms. Automobile manufacturers such as Volkswagen (seven units) were also among the customers for this locomotive. Electric Locomotive Double Set with the SJ Da 903 and the SBB Ce 6/8 III 14305 "Crocodile" The big anniversary event on September 12/13, 2015 in the Swedish town of Gävle for the 100th anniversary of electric main line operation in Sweden offers the unusual meeting of two cult locomotives. The section of the Swedish ore line between Kiruna and Riksgränsen was finally under wire as early as 1915. The railroad museum in Gävle has a multitude of mostly Swedish electric locomotives as a rendezvous for this anniversary. The visit of the SBB Historic Swiss Crocodile Ce 6/8 III 14305 forms a special high point for this. The locomotive is being transferred from Olten (Switzerland) via Rostock (Germany) and Trelleborg (Sweden) to the Swedish town of Ängelholm. From there it will run on September 6/7 under its own power with special trains to Gävle. A special run from Stockholm to Gävle follows on the anniversary on Saturday. The trip back to Switzerland begins on September 15/16 also with special trains from Stockholm via Malmö to Ängelholm. At the anniversary in Gävle, the "Crocodile" will also meet up with the Swedish side road locomotive Da 903, also viewed as a cult locomotive. 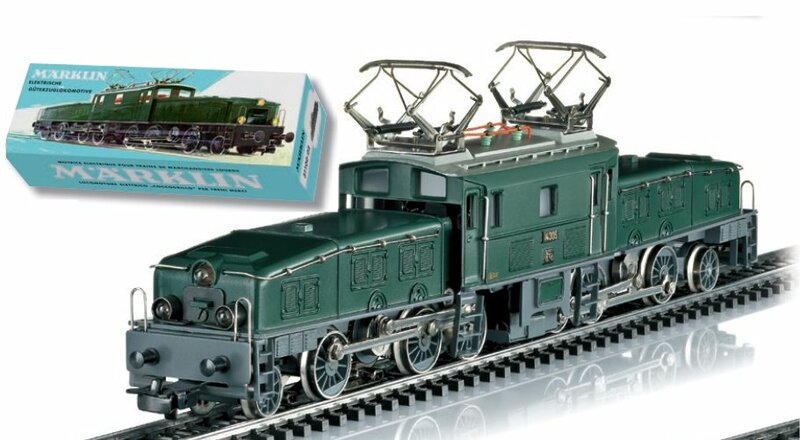 The latter was specially painted in fir green for Märklin and thereby corresponds to the paint scheme for the legendary historic Märklin model 3019. Road number Ce 6/8 III 14305 comes from the second series of the Gotthard freight locomotives, because constantly increasing freight service had caused the SBB to order another 18 "Crocodiles" in 1926/27 as road numbers Ce 6/8III 14301-14318. They had greater performance with 1,809 instead of 1,647 kilowatts / 2,426 instead of 2,209 horsepower and their power trucks now had Winterthur diagonal rod drive by means of an intermediate jackshaft. In the mid-Fifties, their maximum speed could be lifted from 65 to 75 km/h / 41 to 47 mph and they were consequently thus changed in designation to Be 6/8III 13301-13318. The Swedish class Da side rod locomotives are newer units. Due to the increasing need for electric locomotives arising from further electrification of rail lines, the SJ at the end of the Forties urgently needed additional locomotives. The SJ thus decided to revive the proven class D as a side rod driven electric locomotive with the wheel arrangement 2-6-2 even though it had been technically surpassed by that time. The basic superstructure of the new class "Da" was the same as its predecessors: The locomotive was powered by two single-phase series-wound motors that transmitted their power by means of a gear case to the jackshaft between the three driving wheel sets. The latter were connected by means of side rods to the powered jackshaft. The driving wheel sets, bearings, and the traction motors were newly designed. The windows now equipped with rubber seals now gave a modern look. Ninety-three (93) units were built by ASEA between 1953 and 1960. In the late Eighties, the SJ began to draw these locomotives from service, and by the mid Nineties, all of them were scrapped except for a few exceptions. Several units have survived in museums as well as on privately owned railroads. Prototype: German Federal Railroad (DB) class 50 freight steam locomotive, with a coal tender as the type 2Ž2ŽT26 standard design box-style tender as it originally looked. Witte smoke deflectors, standard cab, long running boards falling diagonally at the front by the smoke box, DB Reflex glass headlights, and inductive magnet on one side included. Road number 50 980. The locomotive looks as it did around 1960. Use of this locomotive with a Christmas tree and a Christmas design has not been confirmed. Model: The locomotive has an mfx digital decoder and extensive sound functions. It also has controlled high-efficiency propulsion. 5 axles powered. Traction tires. The locomotive and tender are constructed mostly of metal. A 7226 smoke unit can be installed in the locomotive. The triple headlights change over with the direction of travel. They and the smoke unit that can be installed in the locomotive will work in conventional operation and can be controlled digitally. Maintenance-free warm white LEDs are used for the lighting. The special light function is a Christmas tree with LED lighting that can be controlled digitally. The locomotive whistles "Oh Christmas Tree" as a special sound function. There is a permanent close coupling with a guide mechanism between the locomotive and tender that can be adjusted for the radius of the track. The rear of the tender and the front of the locomotive have close couplers with NEM pockets and guide mechanisms. The minimum radius for operation is 360 mm / 14-3/16". Protective piston sleeves, brake hoses are included. Length over the buffers 26.4 cm / 10-3/8". Christmas tree with LED lighting. 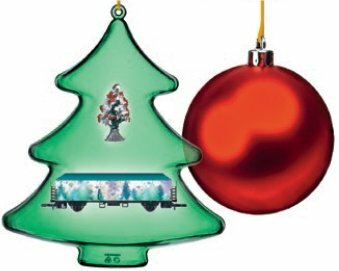 "Oh Christmas Tree" steam locomotive composition. Motive power for the H0 Christmas cars that have appeared previously. Prototype: German State Railroad Company (DRG) version of the Prussian class P10 steam passenger locomotive. Version without smoke deflectors and with a Prussian type 2Ž2ŽT 31,5 tender without additional coal bunker boards. Model: The locomotive has an mfx digital decoder, controlled high-efficiency propulsion, and extensive sound functions. 4 axles powered. Traction tires. The locomotive and tender are constructed mostly of metal. The 72270 smoke unit can be installed in the locomotive. The dual headlights change over with the direction of travel. They and the smoke unit that can be installed in the locomotive will work in conventional operation and can be controlled digitally. Maintenance-free warm white LEDs are used for the lighting. There is an adjustable close coupling with a guide mechanism between the locomotive and tender. There is a close coupler with an NEM pocket and guide mechanism on the rear of the tender. Protective sleeves for the piston rods are included as detail parts. Length over the buffers 26.3 cm / 10-3/8". This model can be found in a DC version in the Trix H0 assortment under item number T22239. Prototype: Schnellzug-Dampfl okomotive Baureihe 01.5 mit Kohlen-Tender. Reko-Ausführung der Deutschen Reichsbahn der DDR (DR/DDR). Mit Boxpok-Rädern, Kohlen-Einheitskastentender 2´2´T34, Witte-Windleitblechen in spezieller Bauform für die BR 01.5, durchgehende Domverkleidung, einseitigem Indusi und Puffertellerwarnanstrich. Betriebsnummer 01 512. Betriebszustand um 1967. Model: Mit Digital-Decoder mfx+ und umfangreichen Geräuschfunktionen. Geregelter Hochleistungsantrieb mit Schwungmasse im Kessel. 3 Achsen angetrieben. Haftreifen. Lokomotive und Tender weitgehend aus Metall. Eingerichtet für Rauchsatz 7226. Fahrtrichtungsabhängig wechselndes Dreilicht-Spitzensignal und nachrüstbarer Rauchsatz konventionell in Betrieb, digital schaltbar. Führerstandsbeleuchtung zusätzlich digital schaltbar. Beleuchtung mit wartungsfreien warmweißen Leuchtdioden (LED). Kurzkupplung mit Kinematik zwischen Lok und Tender. Am Tender kinematikgeführte Kurzkupplung mit NEMSchacht. Befahrbarer Mindestradius 360 mm. Kolbenstangenschutzrohre und Bremsschläuche liegen bei. Länge über Puffer 28,2 cm. Prototype: Schnellzug-Dampfl okomotive Baureihe 01.5 mit Öl-Tender als Öl-Hauptfeuerung. Reko-Ausführung der Deutschen Reichsbahn der DDR (DR/DDR). Mit Speichen-Räder, Einheitskastentender 2´2´T34 (Öl), Witte-Windleitblechen in spezieller Bauform für die BR 01.5, durchgehende Domverkleidung, ohne Indusi, mit Zierstreifen. Betriebsnummer 01 0505-6. Betriebszustand um 1975/76. Prototype: Mitsui Rail Capital Europe (MRCE) multiple system electric locomotive 91 80 6182 560-3, leased to TX Logistik (TXL), built starting in 2000. Model: The locomotive has the new mfx+ digital decoder, controlled high-efficiency propulsion, and extensive sound functions. 2 axles powered. Traction tires. The locomotive has triple headlights and dual red marker lights that change over with the direction of travel. They will work in conventional operation and can be controlled digitally. Long distance headlights can be controlled separately. The headlights at Locomotive Ends 2 and 1 can be turned off separately in digital operation. When the headlights are turned off at both ends of the locomotive, the double "A" lights are activated. Maintenance-free warm white and red LEDs are used for the lighting. The engineer's cabs have interior details. The locomotive has separately applied metal grab irons. Length over the buffers 22.5 cm / 8-7/8". Road Number 182 560 in a Special Paint Scheme for "25 Years of German Reunification" In the summer of 2000, the ÖBB refused permission in general for the DB class 152 to operate on the former's rails. The DB AG reacted very quickly and ordered 25 two-system locomotives from Siemens that were extensively similar in design to the ÖBB class 1116 "Taurus" (Bull). The German dual-system locomotives can be considered as a further development of the class 152. Delivery of the new DB class 182 began in July of 2001 and was completed as early as December of 2001. Its main electrical components, the single wheel set control with four pulse converters, the three four-quadrant controllers switched in parallel for the two DC intermediate circuits, as well as the control and operation are very similar to the class 152. Essential differences are in the shape of the locomotive ends and in the design of the trucks. The striking rounded end shape with the fiberglass hood made of plastic provides an aerodynamic look. The new truck is designed for high speeds and was used for the first time on the Spanish Euro Sprinter. Its core piece is the so-called high-efficiency propulsion with separated brake shaft (HAB) that in principle corresponds to a hollow shaft propulsion with rubber cardan joints. In the Siemens nomenclature, the dual-system locomotives are known as the "ES 64 U2". These units are in use on not just the DB and the ÖBB, but also on different "state" and private transport firms. A considerable number of them consist of leased locomotives, a number of which are used by MRCE Dispolok GmbH (formerly Siemens Dispolok). Most of them have been painted in an inconspicuous black scheme. In April of 2015 ES 64 U2-060 (road number 182 560) was selected from this pool to mark "25 Years of German Reunification" with attractive adhesive film. Their ends are adorned with the striking slogan of the Leipzig Monday Demonstrations "Wir sind ein Volk" / "We are one people". 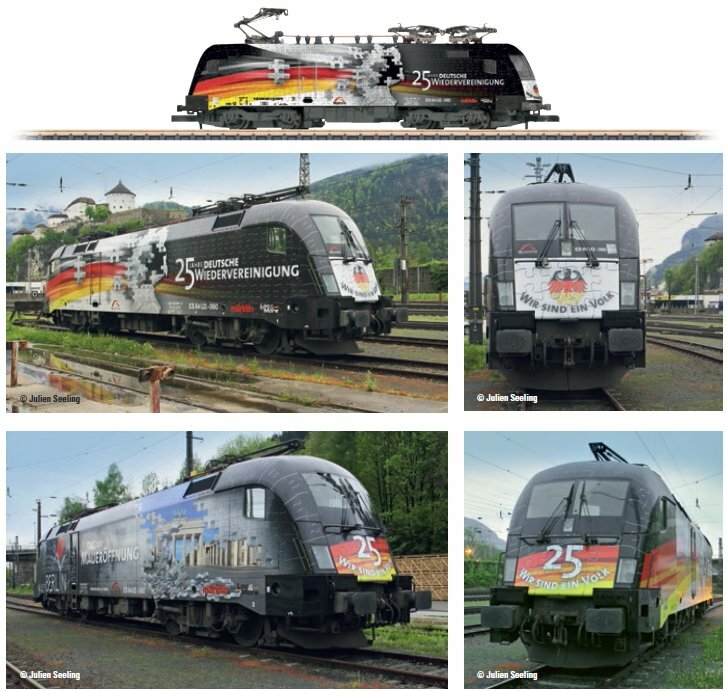 In addition, one side of the locomotive celebrates "25 Jahre Deutsche Wiedervereinigung" / "25 Years of German Reunification" while the other side marks the "Tag des Mauerfalls" / "The Day the Wall Fell" in Berlin. The MRCE locomotive is used by TX Logistik. Vorbild: 6 verschiedene Schnellzugwagen unterschiedlicher Bauarten, in der Ausführung der Deutschen Bundesbahn (DB), für den Interzonen- Zug D 455 von Frankfurt/Main über Fulda, Bebra, Gerstungen, Eisenach, Erfurt, Leipzig, Cottbus nach Frankfurt/Oder. 3 Abteilwagen Büm 234, 2. Klasse. 1 Abteilwagen ABüm 225, 1./2. Klasse. 1 Halbgepäckwagen BDüms 273, 2. Klasse. 1 Abteilwagen Aüm 203, 1. Klasse. Betriebszustand um 1975. Modell: Befahrbarer Mindestradius 360 mm. Drehgestelle der Bauart Minden-Deutz schwer, mit Nachbildung von Klotzbremsen und Generatorantrieb. Alle Wagen vorbereitet für stromführende Kupplungen 7319 oder stromführende trennbare Kurzkupplungen 72020/72021 sowie zum Einbau einer Innenbeleuchtung 73400/73401 (je 2 x) mit Schleifer 73406 und Zugschlussbeleuchtung 73407. Alle Wagen mit Zuglaufschilder und unterschiedlichen Ordnungsnummern im Zugverband versehen. Gesamtlänge über Puffer 170,2 cm. Gleichstromradsatze je Wagen 4 x 700580. Prototype: German Federal Railroad (DB) type Bi "Donnerbüchse" / "Thunder Box" standard design passenger car, 2nd class. "Bottle Green" paint scheme. The car looks as it did around 1957. Model: The car has factory-installed LED interior lighting and current-conducting couplers. The interior lighting can be controlled digitally from the 36082 locomotive. The car also has open platforms and crossovers. Length over the buffers approximately 16 cm / 6-5/16". The car's interior lighting can be controlled digitally from the 36082 locomotive. The diesel locomotive and car set to go with this car can be found in the Märklin MHI H0 assortment under item numbers 36082 and 43131. In 1976 the German Federal Railroad placed the prototype (car number 51 80 89-80 600-5) of a new, comfortable generation of entertainment cars into service. These type WGmh 824 cars were planned to set new standards for the highest level of comfort in relation to adventure trips, rolling conferences, or excursion trips. At one end of the car was two compartments for train officials as well as a toilet, at the other end a galley with an adjoining bar. One of the two compartments for train officials served as a technology space with music equipment and control of the lighting installation. Approximately two thirds of the car was planned as entertainment space and could be used as a dining room, conference room, or dance area. Only one small seating corner was permanently installed at one end of this space. Otherwise, the interior could be arranged to meet the requirements of the occasion. Themes from cities in Lower Saxony decorated the side walls of the entertainment space. The bulkhead walls by contrast had an intertwined pattern in different colors. The car ran on Minden-Deutz type 36 trucks and was rated for 160 km/h / 100 mph. Its underframe was built in the customary manner with a frame, cross members, and plates constructed of steel. Its car body was a welded design with side walls, end walls, and roof plates. However, cross bracing had to be installed to accommodate extreme variations in the load under certain circumstances (such as during dance events) in the entertainment area. Right from the time it was placed into service, the entertainment car ran in the DB standard paint scheme of ocean blue / ivory that was current at that time. A car set to go with this car can be found in the Märklin MHI H0 assortment under item number 43867. Prototype: Type Rlmms four-axle low side car loaded with two Bobby Car models. Model: The railroad car is loaded with two high-quality Bobby Car models constructed of metal. The Bobby Cars look like Bobby Cars made in the Seventies. The railroad car has Relex couplers. Length over the buffers 16 cm / 6-5/16". DC wheel set 4 x 700580. The high-quality Bobby Car models constructed of metal invite you to play with them. Prototype: 6 different tank cars painted and lettered for GATX Rail Germany GmbH, Hamburg, Germany. Cars with non-insulated tanks and ladders at one end. Type "Zans". Model: The cars have detailed, partially open frames. They also have rectangular buffers. The cars have type Y 25 welded trucks. They have separately applied details. All of the cars are individually packaged. Length over the buffers per car 18.0 cm / 7-1/8". DC wheel set per car 4 x 700580. Prototype: Type Saadkms 690 special car with 8 small wheel sets for transporting entire semi-truck rigs. Car painted and lettered for Railion Deutschland AG. The car looks as it did around 2005. Models: This is an end car with swinging and removable buffer beams and adapters for normal close couplers. Chock blocks for trucks are included with the car. 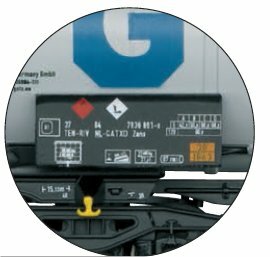 A truck model painted and lettered for Märklin is included. Length over the buffers 23.2 cm / 9-1/8". DC wheel set 8 x 432950. Model truck painted and lettered for Märklin. 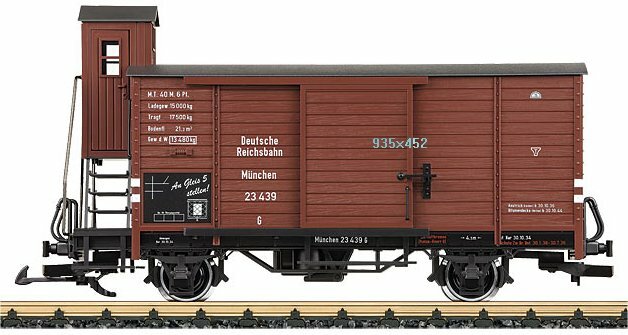 The 5-part "Rollende Landstraße" / "Rolling Road" depressed floor flat car set to go with this end car can be found under item number 47418. Prototype: Type Rlmms four-axle low side car. Fictitious design for Christmas. Model: The low side car is loaded with the lettering "XMAS" made of laser-cut wood. Golden candles for attaching to the lettering are included. Length over the buffers 16.0 cm / 6-5/16". DC wheel set 2 x 700580. "XMAS" lettering made of laser-cut wood � can be removed from the freight car. Golden candles for attaching to the lettering provide an Advent atmosphere. Attractive addition to the series of Christmas cars. 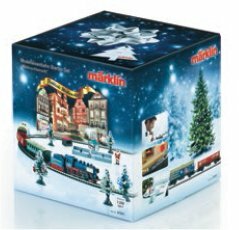 Model: The container car comes in a special paint scheme with themes form the world of the Märklin Start up Club. The car has Relex couplers. Length over the buffers 11.5 cm / 4-1/2". DC wheel set 2 x 700580. Annual model for members of the Märklin Start up Club and Märklin Insider. R3 = 515 mm / 20-1/4" / 15°. Removable roadbed slopes. This track section is required on both branches of the 24771 and 24772 wide radius curved turnouts. This unit is for fast programming of the new märklin LokDecoder3 and märklin Sounddecoder3. You can connect it easily to your PC/laptop by means of a USB port. You will require the märklin Decoder Tool Software (mDT) that can be downloaded easily on our homepage. The mDT software will help you transfer existing sound or sound you have recorded on your own quickly and easily. You can now also program very easily all other settings such as maximum speed, braking behavior, etc. Fast programming of the new märklin mLD3 and mSD3 decoders. This decoder is for converting Märklin/Trix H0 locomotives with built-in high-efficiency motors or other DC motors. The märklin LokDecoder3 has a 21-pin interface connector and an accompanying interface connector circuit board for converting analog and digital locomotives. 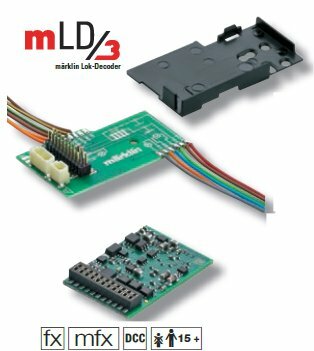 The märklin LokDecoder3 supports the digital formats mfx, MM1, MM2, and DCC. This circuit board is for installation in locomotives and powered rail car trains with 2 pickup shoes. It enables operation with the pickup shoe at the "front" of the unit (depending on the direction of travel) picking up power. This guarantees that units such as an ICE come to a halt at the right location in a stop block. An mLD3 or mSD3 decoder is also required. For steam, diesel, and electric locomotives. This decoder is for converting Märklin/Trix H0 locomotives with built-in high-efficiency motors or other DC motors. 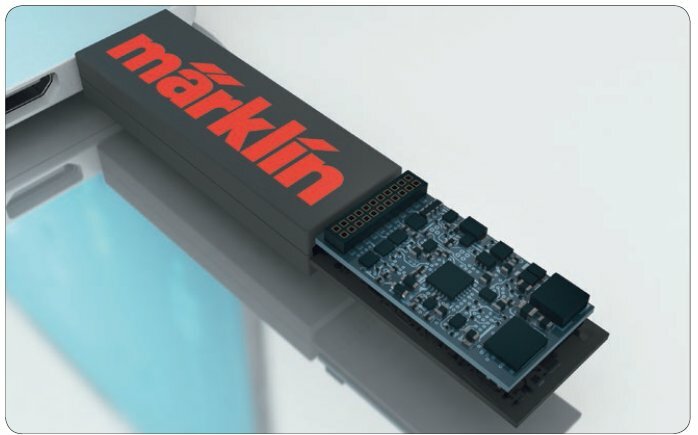 The märklin SoundDecoder3 has a 21-pin interface connector and an accompanying interface connector circuit board for converting analog and digital locomotives. 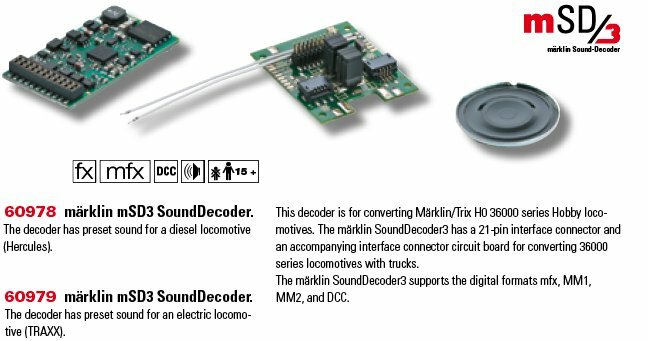 The märklin SoundDecoder3 supports the digital formats mfx, MM1, MM2, and DCC. The decoder has preset sound for a steam (60975), diesel (60976) or electric (60977) locomotive. For Hercules and TRAXX locomotives. This decoder is for converting Märklin/Trix H0 locomotives with built-in high-efficiency motors or other DC motors. The märklin SoundDecoder3 has a wiring harness soldered to it with an eight-pin NEM interface connector plug for installation in many locomotives with the appropriate NEM interface connector and locomotives with a lack of space. The märklin LokDecoder3 supports the digital formats mfx, MM1, MM2, and DCC. 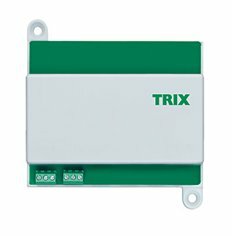 This decoder is for converting Märklin/Trix H0 locomotives with built-in high-efficiency motors or other DC motors. The märklin SoundDecoder3 has a wiring harness soldered to it with an eight-pin NEM interface connector plug for installation in many locomotives with the appropriate NEM interface connector and locomotives with a lack of space. 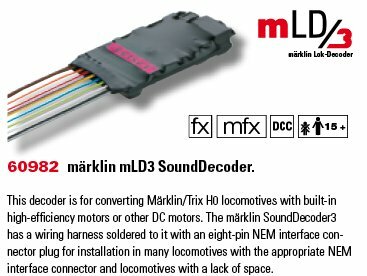 The märklin LokDecoder3 supports the digital formats mfx, MM1, MM2, and DCC. The decoder has preset sound for a steam (60985), diesel (60986) or electric (60987) locomotive. Prototype: Modern style refrigerator car. Model: The car comes in a Christmas design. Length over the buffers 64 mm / 2-1/2". One-time series only in 2015. The Christmas car for 2015 is presented in a clear pine tree. This can be hung on a Christmas tree with the help of the cord included with the car and continues the popular series of festive themes from previous years. Prototype: 1 class 24 steam locomotive, 1 high-side gondola, 1 refrigerator car, 1 passenger car. Model: The locomotive is constructed of metal. The locomotive and the tender are decorated for Christmas. It has a 5-pole motor, and all of the driving axles are powered. All 3 cars are also decorated for Christmas. Also included are 3 each decorated Christmas trees and kits for "Christmas Stands", "Santa Claus", and "Skating Rink", which can be assembled to make a small winter Christmas market. The stands can also be transported on the high-side gondola. Also included in this set: 2 each straight track, 10 each curved track, a rerailer, and a 230 volt / 12 VA switched mode power pack with a suitable train controller. A track plan brochure is also included. Train length approximately 250 mm / 9-7/8". Track length approximately 510 mm / 20-1/16". This set can be expanded with the 82720 set, with the 8190 or 8191, 8192, 8193, and 8194 SET track sets, or it can be expanded with your own designs. Prototype: Car set consisting of 3 DB Schenker Rail type Sdgkms 707 flat cars. Designed for the transport of containers, truck interchangeable load units, or even semi-truck trailers. Model: The car frames are constructed of metal. Two cars are each loaded with 2 removable truck interchangeable load units for the freight forwarder "Schenker DB Logistics". One car is loaded with a semi-truck trailer lettered for "DB-Schenker". The cars and loads have finely executed paint schemes and lettering. All of the cars and the interchangeable load units have different car numbers or registration numbers. The cars have built-in close coupler hooks. Total length over the buffers 234 mm / 9-1/4". One-time series for the MHI Program. The perfect add-on for the locomotive 88194. Prototype: 1 tank car and a low side car with a brakeman�s cab. Model: The ? "Glühwein" tank car and the low side car with a brakeman�s cab come in a Christmas paint scheme. Both cars have black wheel sets. 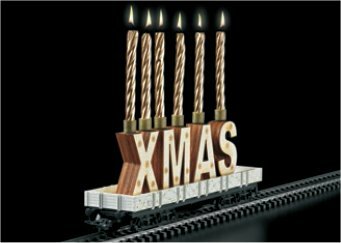 The carefully modelled Christmas tree can be placed next to the tracks on your layout or can also be transported on the low side car. 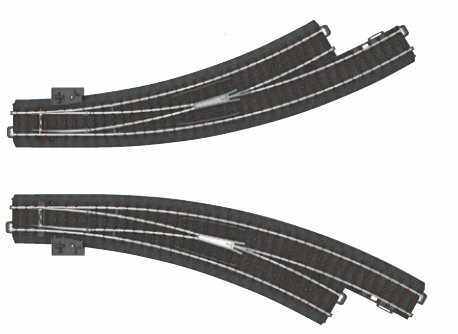 This add-on set also has material for a storage siding: 1 manual turnout, 3 sections of straight track, 1 section of curved track, and a track bumper. 82720 is the perfect addition to 81709. Prototype: Rail Traction Company (RTC) class 189 fast freight locomotive. Multiple system locomotive with 4 pantographs, from the Siemens EuroSprinter family. Model: All axles on both trucks are powered. Warm white and red LEDs are used for the headlights and marker lights. The wheel treads are dark nickel-plated. The inner 2 pantographs are wired to pick up power. Length over the buffers 87 mm / 3-7/16". Warm white LED headlights that change over with the red marker lights. One-time production for the MHI. The Class 189 ("Teufelszebra" / "Devil's Zebra") The Railroad Transport Company (EVU) "Lokomotion Company for Railroad Motive Power, Inc." has created an unmistakable look with its "Zebra" locomotives in order to set themselves clearly apart from the competition in terms of appearance. Initially, the Lokomotion locomotives had a paint scheme of only white with blue zebra stripes. To the delight of many railroad fans came then units with red, red-blue, green, gray, and white reflective zebra stripes. The locomotives in the red "zebra look" quickly acquired the nickname "Teufels-Zebra" / "Devil's Zebra". As the first private railroad service firm, Lokomotion made use of the opportunities offered by the liberalization in Alpine transit in October of 2001 and has since developed into one of the leading railroad service firms in freight service across the Alpine area on the Brenner and Tauern axis. Focal point here are the combined service as well as carload service partially in cooperation with experienced reliable partners domestically and abroad. In Italy, this is the South Tyrol Rail Traction Company, Inc. (RTC), which has also had several of its locomotives painted in the Zebra design. A continuous production chain can thus be offered from Germany to Italy, because since 2005 a large part of the Lokomotion trains run with just a crew change at the current system border between Austria and Italy, which minimizes border stops and facilitates operations. Lokomotion uses its own and leased electric locomotives from the classes 139, 185, 186, and 189. Among the red "Devil's Zebras" are also four class 189 four-system units (Siemens nomenclature "ES 64 F4"), which run chiefly between Munich and Italy. They can be use as "new" Europa locomotives under both 15 and 25 kilovolt AC voltage and under 1.5 and 3 kilovolt DC voltage. The class 189 units are based on the DB class 152, but the former has considerable differences from its predecessor in the mechanical and especially in the electrical areas. Externally, there are two striking differences in the ribbed side walls and the headlights consisting of LEDs. The car set to go with this locomotive can be found under item number 82288. Prototype: TX Logistik/MRCE class ES 64 U2 (Taurus) fast general-purpose locomotive. Road number 91 80 6182 560-3 painted and lettered as the so-called "Germany Locomotive". Model: The locomotive is a tooling variation with a third single-arm pantograph. The two outer pantographs are wired to take power. The catenary selector switch is located out of sight inside the locomotive. Both trucks are powered. Maintenance-free warm white / red LEDs are used for the locomotive's headlights / marker lights that change over with the direction of travel. The locomotive has dark wheel treads and pantographs. Length over the buffers 87 mm / 3-7/16". Road Number 182 560 in a Special Paint Scheme for �25 Years of German Reunification� In the summer of 2000, the ÖBB refused permission in general for the DB class 152 to operate on the former's rails. The DB AG reacted very quickly and ordered 25 two-system locomotives from Siemens that were extensively similar in design to the ÖBB class 1116 "Taurus" (Bull). The German dual-system locomotives can be considered as a further development of the class 152. Delivery of the new DB class 182 began in July of 2001 and was completed as early as December of 2001. Its main electrical components, the single wheel set control with four pulse converters, the three four-quadrant controllers switched in parallel for the two DC intermediate circuits, as well as the control and operation are very similar to the class 152. Essential differences are in the shape of the locomotive ends and in the design of the trucks. The striking rounded end shape with the fiberglass hood made of plastic provides an aerodynamic look. The new truck is designed for high speeds and was used for the first time on the Spanish Euro Sprinter. Its core piece is the so-called high-efficiency propulsion with separated brake shaft (HAB) that in principle corresponds to a hollow shaft propulsion with rubber cardan joints. In the Siemens nomenclature, the dual-system locomotives are known as the �ES 64 U2�. These units are in use on not just the DB and the ÖBB, but also on different �state� and private transport firms. A considerable number of them consist of leased locomotives, a number of which are used by MRCE Dispolok GmbH (formerly Siemens Dispolok). Most of them have been painted in an inconspicuous black scheme. 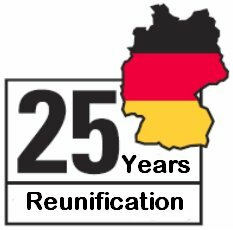 In April of 2015 ES 64 U2-060 (road number 182 560) was selected from this pool to mark �25 Years of German Reunification� with attractive adhesive film. Their ends are adorned with the striking slogan of the Leipzig Monday Demonstrations �Wir sind ein Volk� / �We are one people�. In addition, one side of the locomotive celebrates "25 Jahre Deutsche Wiedervereinigung" / "25 Years of German Reunification" while the other side marks the "Tag des Mauerfalls" / "The Day the Wall Fell" in Berlin. The MRCE locomotive is used by TX Logistik. Prototype: German Federal Railroad (DB) class 41 steam locomotive with a new design high-efficiency boiler and a type 2Ž2ŽT34 oil tender as the locomotive and tender looked in Era III. Model: The locomotive is completely new tooling. The locomotive has a frame, superstructure with boiler, and tender constructed of die-cast zinc. Other separately applied parts are constructed mostly of metal. This is a highly detailed model with many separately applied parts and a prototypically detailed engineer's cab. The locomotive has a raised smoke stack and a smoke box door without a central locking device. The smoke box door can be opened. The locomotive has an inductive magnet on one side, water tank hatches that can be opened, cab doors that can be opened, buffer plate warning stripes, and much more. The locomotive has an mfx digital decoder, controlled high efficiency propulsion, and a sound generator with operating sounds synchronized with the wheels as well as extensive sound functions. It can be operated with AC power, DC power, Märklin Digital, or DCC. All of the driving axles are powered. The locomotive has a built-in smoke unit with smoke exhaust and cylinder steam synchronized with the wheels, and a steam whistle. The triple headlights have a light color correct for the era and change over with the direction of travel. The headlights will work in conventional operation and can be controlled digitally. Maintenance-free, warm white LEDs are used for the lighting. The locomotive has sprung buffers, engine cab lights, firebox lights, and running gear lights. The locomotive has a reproduction of the prototype coupler on the front and a newly designed remote-controlled Telex coupler on the rear of the tender. Both of the couplers can be replaced by the other type of couplers. The valve gear switchover is in 3 steps (forward, reverse, continuous operation). An accessory package with a reproduction of the prototype coupler, a claw coupler, smoke fluid, and a figure of a locomotive engineer and a fireman is included with the locomotive. Minimum radius for operation 1,020 mm / 40-3/16". Length over the buffers 75 cm / 29-1/2". Highly detailed full metal construction. Frame superstructures, boiler, etc. constructed of die-cast zinc. A smoke generator with smoke exhaust and cylinder steam synchronized with the wheels, and a steam whistle included. Smoke box door and dome covers with many original details, can be opened. Headlights with a light color correct for the era and warm white LEDs. Two-color fire box flickering light. 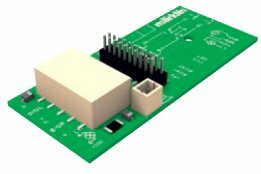 mfx decoder for operation with AC power, DC power, Märklin Digital, or DCC. Valve gear switchover in 3 steps (forward, reverse, continuous operation) with a servo motor. Tender includes a remote-controlled Telex coupler. Prototype: German Federal Railroad (DB) class E 60 as it looked in Era IIIa. Switch engine with cab windows as they originally looked in real life, without switching platforms, type SBS 10 pantograph, 2 DB design headlights, and 1 marker light. Green basic paint scheme. Road number E 60 13, based in Treuchtlingen. Model: The locomotive is completely new tooling. The frame and locomotive body are constructed of metal. The locomotive has an mfx digital decoder, controlled high-efficiency propulsion, and extensive sound functions. It can be operated with AC power, DC power, Märklin Digital, or DCC. All of the driving axles are powered by means of a centrally mounted powerful motor. The type SBS 10 double-arm pantograph with a single contact strip can be raised and lowered in digital operation by means of a motor. The white dual headlights are LEDs. They will work in conventional operation, and can be controlled digitally. An upper marker light also comes on depending on the direction of travel. The cab has warm white LED lighting. 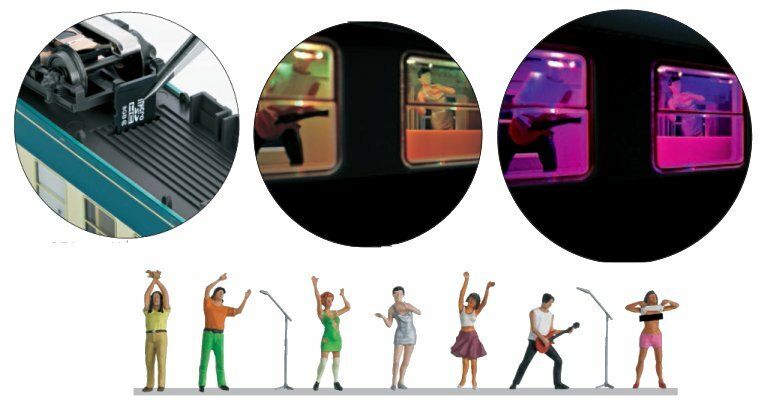 The cab doors can be opened, there are interior details, and the cab has a figure of an engineer. The locomotive has metal grab irons and many other separately applied details: signs, antenna, windshield wipers, whistle, etc. The buffer beams have sprung buffers and separately applied brake lines. The locomotive has built-in, completely newly developed remote-controlled Telex couplers front and rear. The locomotive has factory-installed claw couplers that can be replaced by 2 prototype couplers included with the model. Minimum radius for operation 1,020 mm / 40-3/16". Length over the buffers 35 cm / 13-3/4". Completely new tooling constructed of metal. Newly developed remote-controlled Telex coupler front and rear. The DRG E 60 Electric Locomotive "Clean locomotives for switching work at electrified stations" was the DRG's slogan in the Mid-Twenties in Bavaria. It ordered two electric locomotives in 1926 especially for the extended track layouts of the Munich stations in order to be able to use this smoke-free method of operation in switching work too. The DRG stipulated the use of as many components of the newly purchased E 52 and E 91 as possible in the interests of standardized spare parts inventory. The Winterthur diagonal rod drive with a jackshaft and three coupled wheel sets came from the E 91. The drive performance was provided by a double motor that was also used on the E 52 or E 91. Originally, the locomotives had a special design pantograph with two widely spaced contact strips to better bridge separation points in the catenary. The first two units were placed into service in 1927 as E 60 01 and 02. Several small run series followed by June of 1934, the E 60 03-14, which were also used in part at other Bavarian stations. In addition to switching work, the E 60 was also planned for local freight trains and transfer work. Its characteristic design with the two hoods, the rear one being long and the front one relatively short, quickly generated its nickname "Flat Iron". After the annexation of Austria, several units went starting in 1938 to the "Annexation Area" to Innsbruck, Kufstein, and Wörgl. All of the E 60 locomotives survived the war without extensive damage and the units still in Austria came back to Bavarian as part of a locomotive swap in 1945/46. In 1957/58, the DB had the locomotives fundamentally overhauled and updated. They thus were equipped with switching platforms above the buffers, additional windows, and new wiring. By 1964 the E 60 units (from 1968 on: 160) were only running again in Bavaria. Then came Heidelberg as a new home base. The first units to be retired were in 1977 and with the storage of road number 160 012 in June of 1983 switching service with electric locomotives on the DB also ended. Road numbers 160 009, 010, and 012 remain preserved as museum locomotives. Prototype: German Federal Railroad (DB) class 38.10-40 steam locomotive with a tender, with Witte smoke deflectors and 2 boiler attachments. Former Prussian P8. Model: The locomotive has a frame, superstructure, tender, and applied parts constructed mostly of metal. This is a highly detailed model with many separately applied parts and a detailed engineer's cab. The locomotive has an mfx digital decoder, controlled high efficiency propulsion, and a sound generator with operating sounds synchronized with the wheels as well as extensive sound functions. It can be operated with AC power, DC power, Märklin Digital, or DCC. 3 axles powered. The locomotive has a built-in smoke unit with smoke exhaust and cylinder steam synchronized with the wheels. The triple headlights on the locomotive and the tender have a light color correct for the era and change over with the direction of travel. The headlights and the smoke generator will work in conventional operation and can be controlled digitally. The lighting is maintenance-free, warm white LEDs. The locomotive has engine cab and firebox lights. The locomotive has a reproduction of the prototype coupler on the front and on the rear of the tender. An accessory package with a reproduction of the prototype coupler, a claw coupler, a figure of a locomotive engineer and a fireman, and smoke fluid is included with the locomotive. Minimum radius for operation 1,020 mm / 40-3/16". Length over the buffers 64.5 cm / 25-3/8". Completely new tooling for the tub-style tender. A smoke generator with smoke exhaust and cylinder steam synchronized with the wheels included. Smoke box door with many original details, can be opened. Hinged water tank hatch, can be opened from the cab like the prototype. Randomly controlled steam ejection from the safety pressure valve. Running gear lights and engine cab lighting included. About 7.5 kilograms / 16-1/2 pounds weight (locomotive 4.6 kilograms / 10 pounds); length of the tub-style tender 28.9 cm / 11-3/8". Prototype: German Federal Railroad (DB) class 038.10-40 steam locomotive with a tub-style tender, with Witte smoke deflectors and 3 boiler attachments (feed dome, sand dome, steam dome). Former Prussian P8. Model: The locomotive has a frame, superstructure, tender, and applied parts constructed mostly of metal. This is a highly detailed model with many separately applied parts and a detailed engineer's cab. The buffers have replicas of the warning stripes. The locomotive has an mfx digital decoder, controlled high efficiency propulsion, and a sound generator with operating sounds synchronized with the wheels as well as extensive sound functions. It can be operated with AC power, DC power, Märklin Digital, or DCC. 3 axles powered. The locomotive has a built-in smoke unit with smoke exhaust and cylinder steam synchronized with the wheels. The triple headlights on the locomotive and the tender have a light color correct for the era and change over with the direction of travel. The headlights and the smoke generator will work in conventional operation and can be controlled digitally. The lighting is maintenance-free, warm white LEDs. The locomotive has engine cab, firebox lights, and running gear lights. The locomotive has a reproduction of the prototype coupler on the front and a claw coupler on the rear of the tender. An accessory package with a reproduction of the prototype coupler, a claw coupler, a figure of a locomotive engineer and a fireman, and smoke fluid is included with the locomotive. Minimum radius for operation 1,020 mm / 40-3/16". Length over the buffers 64.5 cm / 25-3/8". Prototype: German State Railroad (DR) type Gbkl boxcar. Painted and lettered for Era IVa, for the transport of tetraethyl lead. Model: The type Gbkl car is completely new tooling and is very finely constructed of plastic with very many separately applied details. This is the version with end reinforcements, air brakes, and without a hand brake. The car has separately applied warning signs. The doors on the model can be opened and the model has sprung buffers. The car comes with the system couplers mounted and prototype reproduction couplers and brake hoses for installation on the car are included. Minimum radius for operation is 1,020 mm / 40-3/16". Length over the buffers 37.9 cm / 14-15/16". Prototype: German State Railroad (DR) type Klms 3430 low side car. Model: This car type is completely new tooling very finely constructed of plastic with very many separately applied details. This is the version without a brakeman's platform, with wooden sides, without stake slots. The car comes with the system couplers mounted, prototype reproduction couplers, and brake hoses for installation on the cars. Minimum radius for operation 1,020 mm / 40-3/16". Length over the buffers 37.5 cm / 14-3/4". Prototype: German State Railroad (DR) passenger train: German State Railroad class 132 diesel locomotive. C-C wheel arrangement. 3 different express train passenger cars. Model: The locomotive has a 14-pin digital interface connector and a 5-pole motor. 4 axles powered. Traction tires. The headlights change over with the direction of travel. The cars have a close coupler mechanism. Total train length 585 mm / 23". Oval of track 94 x 44 cm / 38" x 18", station set with two curved turnouts and a passing siding as well as a switching set with a siding with an uncoupler track. A locomotive controller, switched mode power pack, and connection hardware are included. This set can be expanded with the 14301 large track extension set and with the entire Minitrix track program. 14934/14935 electric mechanisms can be installed in all of the turnouts. The 66616 LED lighting kit can be installed in the passenger cars. Prototype: German Federal Railroad (DB) class 38.10-40 passenger locomotive. Former Prussian P 8. Boiler with 3 domes and Witte smoke deflectors. Type 2´2´T 30 tub-style tender. Model: The locomotive and tender are constructed mostly of die-cast metal. The locomotive has a motor with a bell-shaped armature and a flywheel, mounted in the boiler. It also has a built-in digital decoder and a sound generator with the formats DCC, Selectrix, and Selectrix 2. The locomotive and tender are close coupled. 3 axles powered. Traction tires. The locomotive has triple headlights with warm white LEDs. Length over the buffers 114 mm / 4-1/2". For almost 100 years, the railroad fans in Germany and Europe have generally considered the Prussian P8 to be one of the most beautiful locomotives. Over 3,800 units were built from 1906 to 1928 for the Royal Prussian Railroad Administration (K.P.E.V. ), for other provincial railroads, for foreign railroads, and for the German State Railroad (DRG). After 1945 over 300 locomotives were still in use in Germany. The last units worked in regional service well into Seventies. Around 20 locomotives have survived in operational condition down to the present, spread almost all over Europe. Highlights: Headlights can be turned off. Specially designed master packaging. Certificate of authenticity. Road Number 182 560 in a Special Paint Scheme for “25 Years of German Reunification” In the summer of 2000, the ÖBB refused permission in general for the DB class 152 to operate on the former‘s rails. The DB AG reacted very quickly and ordered 25 two-system locomotives from Siemens that were extensively similar in design to the ÖBB class 1116 “Taurus” (Bull). The German dual-system locomotives can be considered as a further development of the class 152. Delivery of the new DB class 182 began in July of 2001 and was completed as early as December of 2001. Its main electrical components, the single wheel set control with four pulse converters, the three four-quadrant controllers switched in parallel for the two DC intermediate circuits, as well as the control and operation are very similar to the class 152. Essential differences are in the shape of the locomotive ends and in the design of the trucks. The striking rounded end shape with the fiberglass hood made of plastic provides an aerodynamic look. The new truck is designed for high speeds and was used for the first time on the Spanish Euro Sprinter. Its core piece is the so-called high-efficiency propulsion with separated brake shaft (HAB) that in principle corresponds to a hollow shaft propulsion with rubber cardan joints. In the Siemens nomenclature, the dual-system locomotives are known as the “ES 64 U2”. These units are in use on not just the DB and the ÖBB, but also on different “state” and private transport firms. A considerable number of them consist of leased locomotives, a number of which are used by MRCE Dispolok GmbH (formerly Siemens Dispolok). Most of them have been painted in an inconspicuous black scheme. In April of 2015 ES 64 U2-060 (road number 182 560) was selected from this pool to mark “25 Years of German Reunification” with attractive adhesive film. Their ends are adorned with the striking slogan of the Leipzig Monday Demonstrations “Wir sind ein Volk” / “We are one people”. 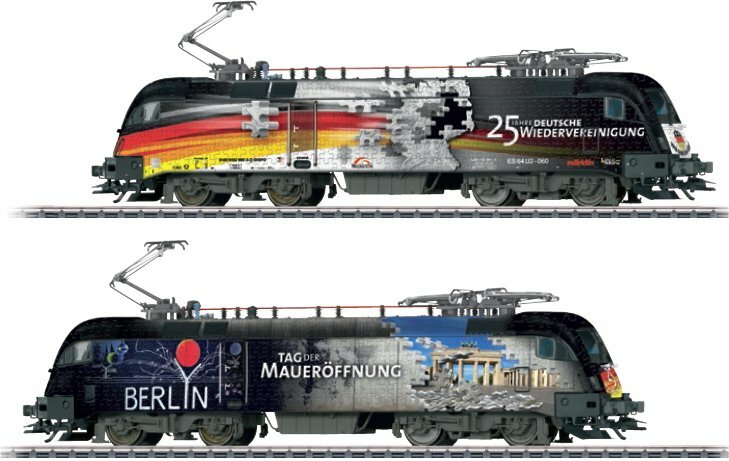 In addition, one side of the locomotive celebrates “25 Jahre Deutsche Wiedervereinigung” / “25 Years of German Reunification” while the other side marks the “Tag des Mauerfalls” / “The Day the Wall Fell” in Berlin. The MRCE locomotive is used by TX Logistik. Model: The locomotive has a digital decoder with extensive sound functions. It also has controlled high-efficiency propulsion with a flywheel, mounted in the boiler. 4 axles powered. Traction tires. The locomotive and tender are constructed mostly of metal. The 72270 smoke unit can be installed in the locomotive. The dual headlights change over with the direction of travel. They and the smoke unit that can be installed in the locomotive will work in conventional operation and can be controlled digitally. Maintenance-free warm white LEDs are used for the lighting. There is an adjustable close coupling with a guide mechanism between the locomotive and tender for different radius curves. There is a close coupler with an NEM pocket and guide mechanism on the rear of the tender. Protective sleeves for the piston rods are included as detail parts. Length over the buffers 26.3 cm / 10-3/8". This model can be found in an AC version in the Märklin H0 assortment under item number 37937. The Interzone express train passenger car set to go with the class 01.5 steam locomotive can be found in the Märklin H0 assortment under item number 42912. This model can be found in an AC version in the Märklin H0 assortment under item number 39205. This model can be found in an AC version in the Märklin H0 assortment under item number 39206. Highlights: Specially designed packaging. Both locomotive sides imprinted differently. Certificate of authenticity. The figures included with this car may have to be altered in size due to technical circumstances. This model can be found in a AC version in the Marklin H0 assortment under item no. 43868. Prototype: 4 four-axle KLV type Sgns 121 flat cars in a light gray basic paint scheme. Privately owned cars of AAE Cargo AG, leased to Hector Rail AB, SE-Danderyd. The cars have ExTe SR12 wooden load frames, support beams, and end wall grills, for transporting logs. The cars look as they did in 2014. Model: The cars have type Y 25 welded trucks. The car floors are partially open and constructed of metal. They have striking fish belly side sills. Each flat car can be equipped with 6 ExTe SR12 stakes, 3 support beams, and 1 end wall grill. Two cars can be arranged as a pair so that the end wall grills are at the outer car ends. The ExTe stakes, support beams, and end wall grills are included for attaching to the cars. All of the cars have different car numbers and are each individually packaged. There is also a master package. Total length over the buffers 91.5 cm / 36". AC wheel set per car 4 x 700150. Highlights: ExTe stakes, support beams, and end wall grills are new, especially for wood transport. New car numbers. A KLV flat car set with other different car numbers can be found in an AC version in the Märklin H0 assortment under item number 47085. Model: = 515 mm / 20-1/4" / 15°. Removable roadbed slopes. This track section is required on both branches of the 62771 and 62772 wide radius curved turnouts. Highlights: Click and Play: Reliable, indestructible plug connection. Perfect in form and appearance: Roadbed, ties, and tie plates. Code 83: Rail profile 2.1 mm / 83/100" high. Universal: For locomotives and cars adhering to NEM and RP 25. View: Air gap between the rail web and the roadbed between the ties. Geometry: Track combinations without having to make up pieces. Modular: The roadbed always fits – no processing required. On the underside: Protected plug contacts instead of damage-prone rail joiners. Model: R3 = 515 mm / 20-1/4" / 30°. Outer curve: 30° with a parallel curve spacing of 64 mm / 2-1/16". Hand lever included. Two (2) each 62315 track are required on the inner and outer curve of the turnout. A roadbed piece to fit here is included. The frog is metal and can be polarized. The 74491 electric turnout mechanism, the 74461 digital decoder, and the 74470 turnout lanterns can be installed on this turnout. Model: 31 speed levels. 111 addresses. Braking operation with braking diodes. In DCC operation: Manual speed level selection 14/28 levels. Automatic switching to 128 speed levels. Addresses can be short up to 127 and long up to 9999. Braking operation with DC voltage and "broadcast mode" braking generators (when analog recognition is turned off). Dimensions approximately 14 mm x 9 mm x 2.5 mm / 1/2" x 3/8" x 1/8".